Cyclamen mites, Stenotarsonemus pallidus, and broad mites, Polyphagotarsonemus latus, are tiny arthropods in the family of tarsonemid mites. They less than 0.3 mm long, translucent, colorless or brown tinted and waxy looking. Tarsonemid mites have four pairs of legs. The fourth pair of females is slender with a long, hair extending from the tip. The fourth pair of legs of males ends in a strong claw. Cyclamen mite eggs are elliptical, 0.1 mm long, translucent, and smooth. Broad mite eggs are elliptical, translucent, colorless, about 0.08 mm long, and are each covered by 29 to 37 whitish bumps. Young broad mites and cyclamen mites are called larvae. They are about 0.2 mm long and are whitish and have three pairs of legs. The legs have microscopic claws and suction cups. The quiescent Stage appears as an immobile, engorged larva. These mites are unusual because they have only one immature stage other than the egg. 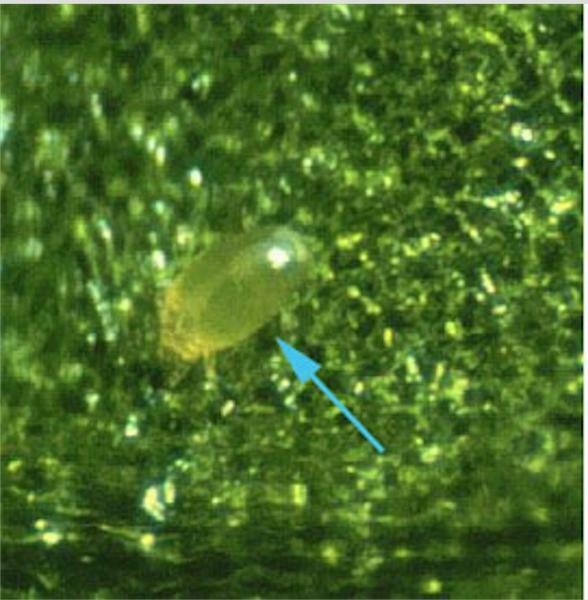 Female broad mites lay 30 to 76 eggs on the leaf surface over an 8- to 13-day oviposition period. Unmated females lay male eggs; mated females usually lay four female eggs for every male egg. The larvae hatch in 2 or 3 days and emerge from the egg shell to feed. Larvae are slow moving and do not disperse far. In 2 or 3 days, the larvae develop into a quiescent larval stage. Quiescent female larvae become attractive to the males which pick them up and carry them to the new foliage. Males and females are very active, but the males apparently account for much of the dispersal of a broad mite population in their frenzy to carry the quiescent female larvae to new leaves. When females emerge from the quiescent stage, males immediately mate with them. Males live 5 to 9 days; females live 8 to 13 days. Cyclamen mites seem to avoid light; they hide in buds and between the calyx and corolla and the stamens and ovaries of flowers. This mite also prefers high humidity. The eggs have delicate shells that can often be found collapsed among masses of unhatched eggs and mites. Deposited in moist, dark places and in small groups, the eggs require about 11 days to hatch. The mites molt only once. New larvae have wrinkled skin that stretches as they grow. They are highly active for about one week, after which they enter a quiescent stage for a few days and then molt to the adult stage. Each day the female lays two or three eggs. Eggs are relatively large in comparison to the adults. Cyclamen mites often exist wherever old cyclamen corms are preserved in the greenhouse. If a suitable host is not present year-round, female mites may semi-hibernate in the soil until a host becomes available. Females are usually more abundant than males in the winter months, and they live longer than males. Figure 1. 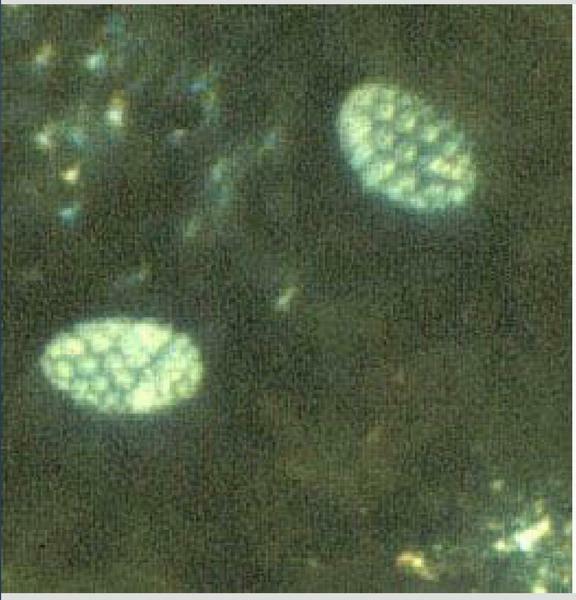 Micrograph of broad mite eggs. 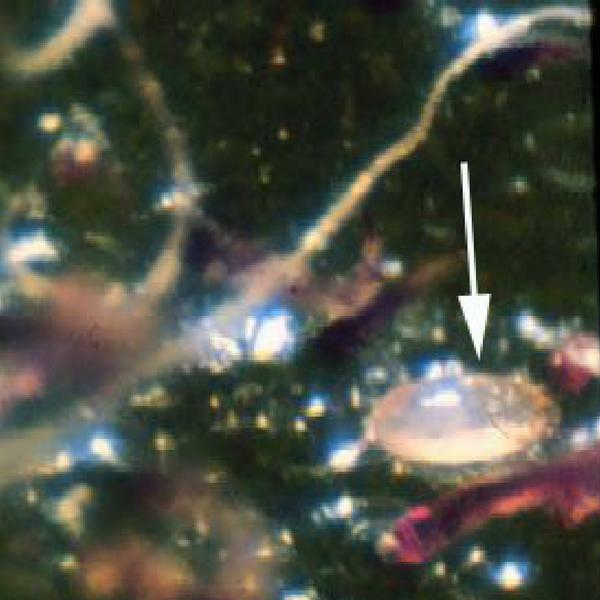 Note the microscopic tubercles that distinguish these eggs from other mite eggs. Figure 2. Female broad mite at extreme magnification. Broad mites infest African violets, ageratum, azalea, begonia, dahlia, fuchsia, gerbera, gloxinia, ivy, jasmine, impatiens, lantana, mango, marigold, peperomia, snapdragon, verbena, and zinnia. Broad mites damage flowers, foliage, and stems of begonia and cyclamen, and bronze the lower leaf surfaces. Their toxic saliva causes twisted, hardened and distorted growth in the terminal of the plant.The effects of their feeding may persist long after the mites have been eradicated. African violets and gloxinias are most often damaged by cyclamen mites. They also have been found on ivy, snapdragon, chrysanthemum, larkspur, geranium, fuchsia, begonia, petunia, daisy, and azalea. These mites cause tuberous begonia and cyclamen flowers to be discolored or to shrivel or wilt. Infested flowers may not open properly or may not open at all. The mites also cause puckering, crinkling, and curling of leaves; infested leaves become brittle. Infested cyclamen buds fail to open or the flowers are distorted. Figure 3. Broad mite damage to begonia. Note the bark-like texture of the injured stem and the stunted leaves. Figure 4. Extreme close-up of a cyclamen mite female. Cyclamen mites and broad mites are very sensitive to heat. They seem to be more difficult to control in winter than in summer due to cooler temperatures. 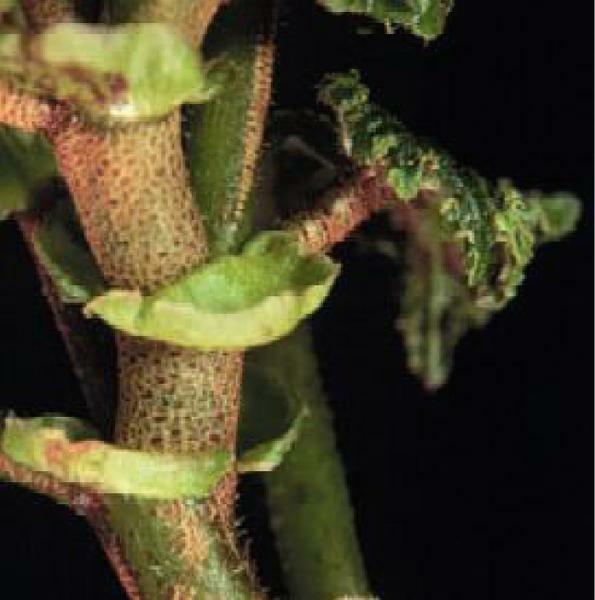 Lowering infested plants into water held at 111°F for 15 minutes will destroy these mites without damaging the plants. Broad mites are also susceptible to horticultural oils and insecticidal soaps as well as to various various pyrethroid insecticides that are labeled for mite suppression. If chemical control is desired, spray or dip the plant thoroughly following the directions on the label. Pyrethroid insecticides are available in the garden section of big box stores and in garden centers..Keep treated plants out of the sun until whatever pesticide dries. Baker, J. R. ed. 1994, revised. Insect and Related Pests of Flowers and Foliage Plants. N.C. Cooperative Extension publication AG-136. 106 pp. Fasulo, T. R. 2016, revised. Common name: broad mite, scientific name: Polyphagotarsonemus latus (Banks) (Arachnida: Acari: Tarsonemidae). Featured Creatures, Entomology & Nematology, FDACS/DPI, EDIS. Publication Number: EENY-183.